Already at first sight, the Acer Aspire 5935G's designated application field was obvious. This does not only apply to the design, which pleases with typical multimedia control elements. No, also the other components are completely orientated on this field, for instance the glossy display in 16:9 cinematic format, the BluRay drive option and the Dolby surround audio system with subwoofer. Last but not least, this Aspire also strives to score with its communication equipment including a webcam for video chats. 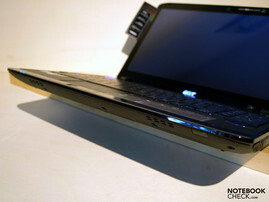 Acer currently offers a whole range of notebooks specialized for home entertainment and multimedia under the name "Aspire". 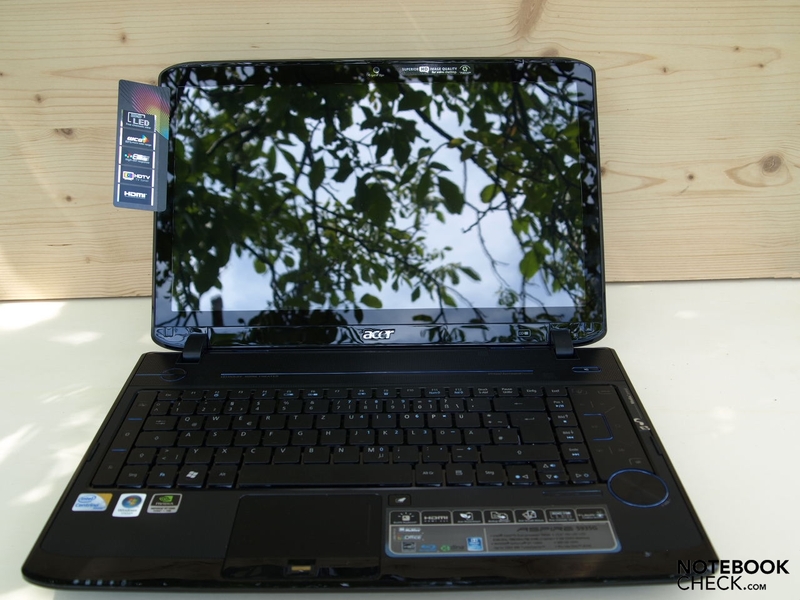 The user can select among various device sizes, starting with a 12 inch (Aspire 2930) up to 18.4 inch (Aspire 8935). 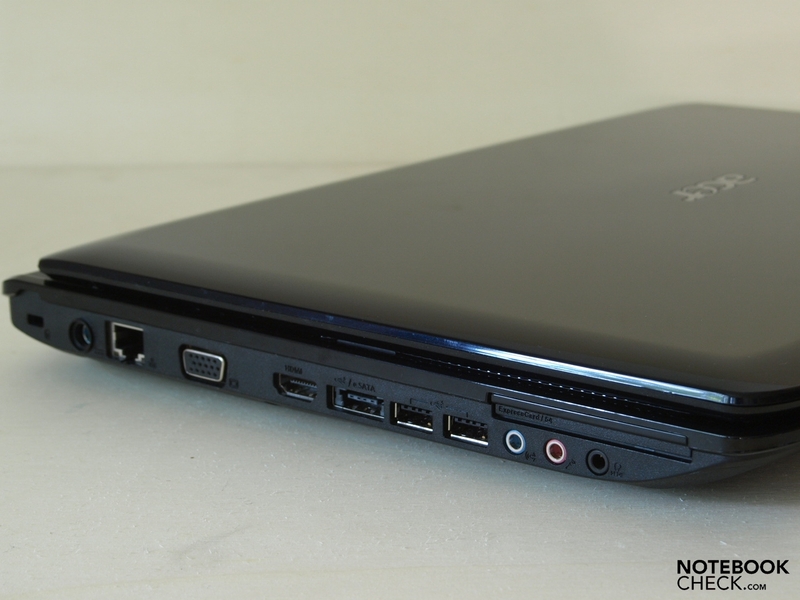 The Aspire 5935G belongs to one of the largest of its kind with 15.6 inches. Note: There is also a row of configuration options available for the Aspire 5935G notebook, which differs in a few details. The tested model is the configuration alternative with the model label: 5935G-9A4G50Bn. Other configurations vary from this for example in regards to the graphic solution, BluRay options and included software. The 593G presents itself completely in black. Without exception? No, single elements have been executed in a dark Safire Blue, for instance the round volume dial is edged blue and the subwoofer on the back is embellished with blue elements. 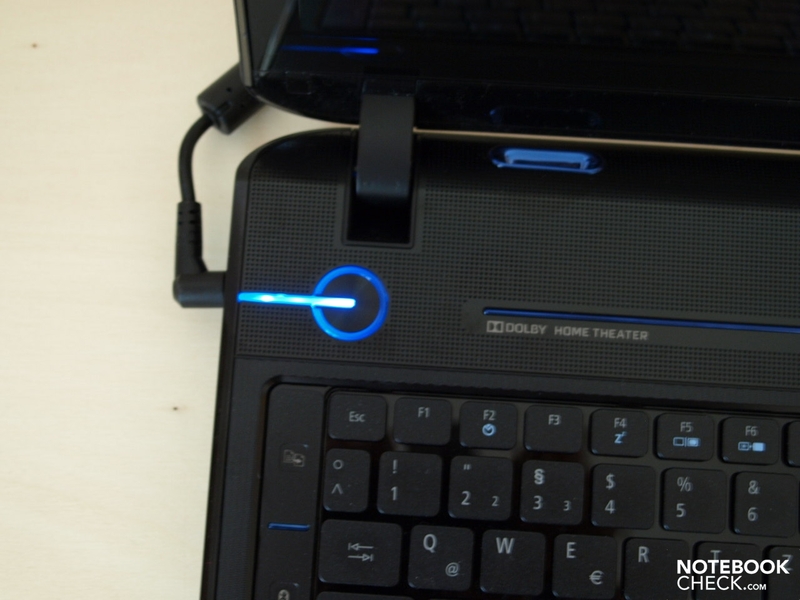 Once plugged into the socket, the blue power button visualization also catches your eye. Actually, the horizontal stripe, symbolizing the cable, should only light up in this condition, but the circle around the power button glows a bit, too. Did you press it? Negative. After enabling, the circle becomes more obvious and glaringly visible, and the keyboard also shines due to white LEDs under each key. 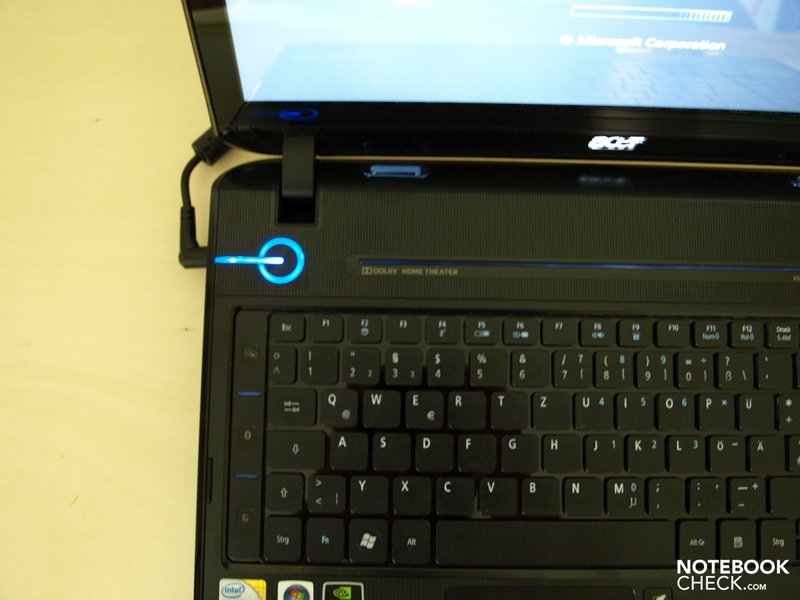 The white/ blue LED lighting, with the exceptions of the wireless LAN key/status lamp, which has been issued in orange and the Acer Power Smart key (green) over the keyboard, is consistent. High-gloss finished surfaces are found, except for the bottom side, everywhere. As usual, this is susceptible for fingerprints and smudge of every kind. The high-gloss look is continued also on the screen, which has been executed in the "edge to edge" design as it is also observed in the current Macbooks, in Dell's Studio XPS notebooks and recently also in the HP HDX16. Even if it looks fabulous, you have to accustom yourself to the reflective display, anyway. Additionally, the wrist rests have a rhombic texture. This structure improves the grip somewhat and is, in view of material selection (plastic), haptically quite alright. Despite the exclusive use of plastic, the case makes a very qualitative impression. The case stability can be generally called good. The weak point is found, as noticed often in other devices, above the optical drive. The case gives in somewhat under pressure there. The same applies, interestingly, to the right wrist rest, but a bit more force has to be used here. The bottom side of the base unit also presents itself as form stable, giving away slightly under pressure under the optical drive. By and large, the base unit shows itself as very twisting resistant. The display lid is less optimal in this respect. Under pressure this gives away a bit, whereas also image distortions can be observed on an activated screen. It obeys to torsion forces better so that merely a slight bending can be observed at lifting at a display corner. Uneven component joints aren't found anywhere. Therefore it can be conclusively determined that stability and manufacturing of the used plastic is adequately good and shouldn't lead to any problems at normal use. Principally, the whole case, with a width of 385 millimeters, a depth of 275 millimeters and a maximum height of 43.6 millimeter, is a fairly compact case in a 15.6 inch format. Together with a total weight of about 3 kilograms, this notebook can't exactly be counted to the lightest and smallest notebooks, which keeps the mobility within limits, anyway. Both display hinges make a relatively small impression. However, they hold the test device's screen adequately in place and it rebounds only slightly at adjustment. Besides that, the hinges are smooth enough to vary the opening angle with one hand. 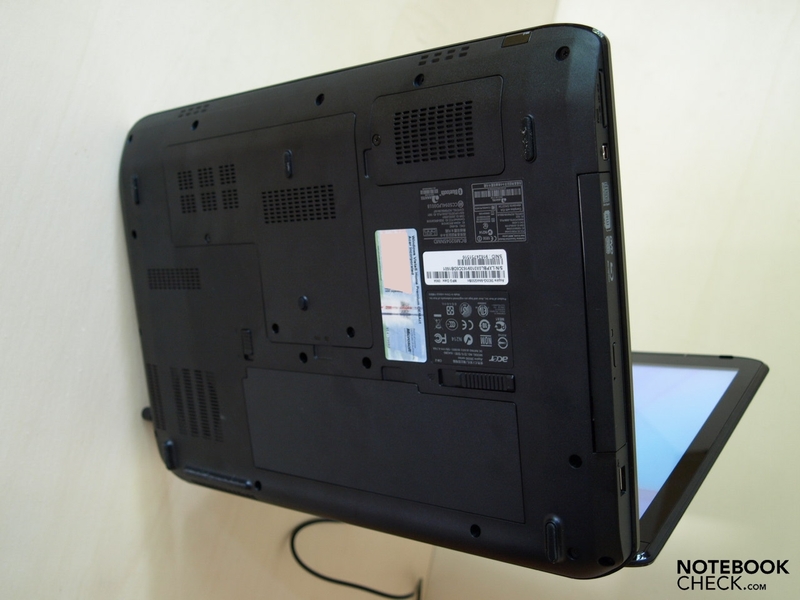 If the opening angle is below approximately ten degrees, the notebook shuts automatically with a fairly loud bang, whereas narrow rubber buffers on the upper display frame and on the sides of the base unit should dampen the collision somewhat. 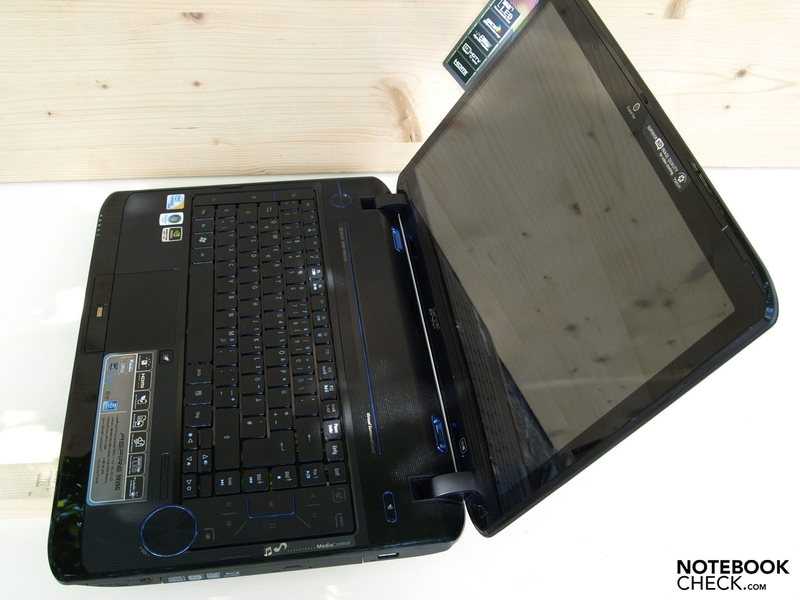 Oppositely, the notebook opens when held a bit on the base unit. Due to the lack of a transport lock, you should take particular care that no (sharp) objects penetrate the gap between keyboard and display in the case of transportation. These could cause quite a bit of damage, especially to the sensitive display. Apart from that, the opening angle is restricted to a maximum of 121 degrees. The reason for this are the angled hinges mounted on the display. 121 degrees are sometimes too little, depending on the location. 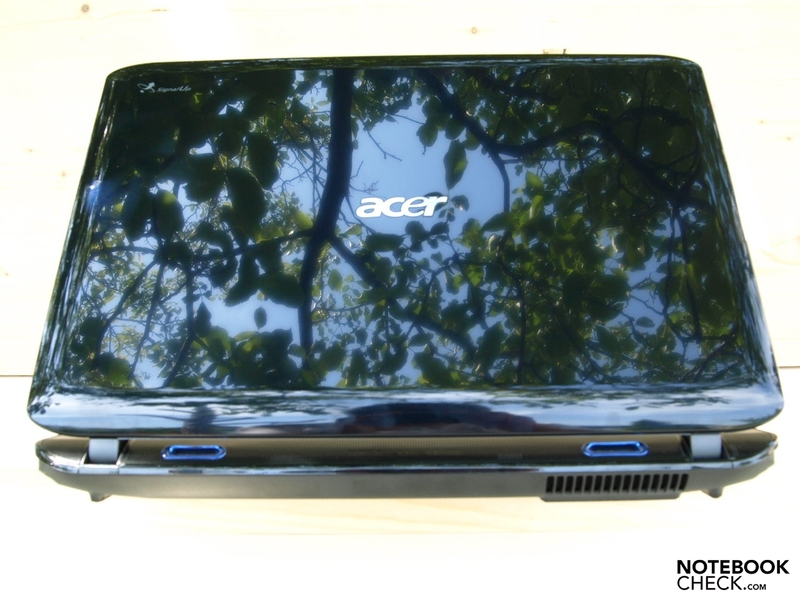 For a notebook of this dimension, the Acer Aspire 5935G may not have particularly generous interface connectivity, but you do find everything you need for office and multimedia applications on the notebook. A total of four USB 2.0 ports, one executed as a combination with eSATA, a LAN, a VGA and an HDMI port count to this. The front and back side have to basically be kept free from interfaces due to the beveled front edge and the opening mechanism. Hence, you only find a Consumer-Infrared-Receiver (CIR) on the front. Therefore, all connection options have been distributed, partly densely packed, on the side edges. The quality of their arrangement is, once again, strongly dependent on the planned use of the device. The right side has an USB 2.0 port in the back area and goes on with the optical drive towards the front. Our test device was equipped with a BluRay drive. Depending on the selected configuration, it could also be a DVD burner, though. A FireWire port (IEEE-1394) and a 6x1 cardreader, which supports the formats: SD, MMC, MMC-plus, MS, MS PRO and xD, follow in the front area. Due to this arrangement with the USB port far in the back area, righties have a distinct advantage because they still generally have the whole work area right of the notebook to use , for example, with an external mouse. Lefties will have their problems with the Acer Aspire 5935G, in opposition to this. The audio ports, headphones with, according to the manufacturer, S/PDIF support, microphone and line-in are found on the far front on the left side edge. 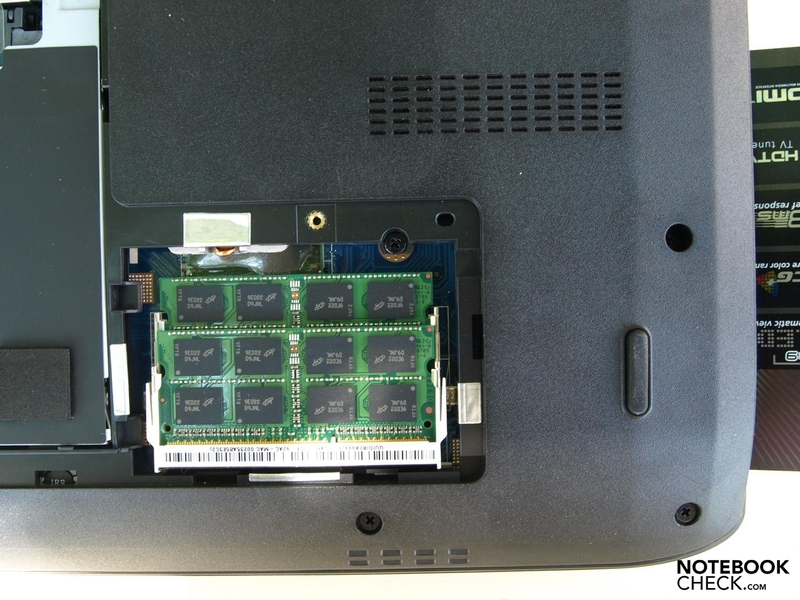 An ExpressCard/54 slot, over which you can expand the system with additional functions, is behind these. Two further standard USB 2.0 ports and a combined eSATA/USB interface follow. Hence, lefties can almost be sure that distracting cables will restrict the work surface beside the notebook. Apart from that, the USB ports on this side are so close to each other that devices with a broad USB plug are better relegated to the right side edge. 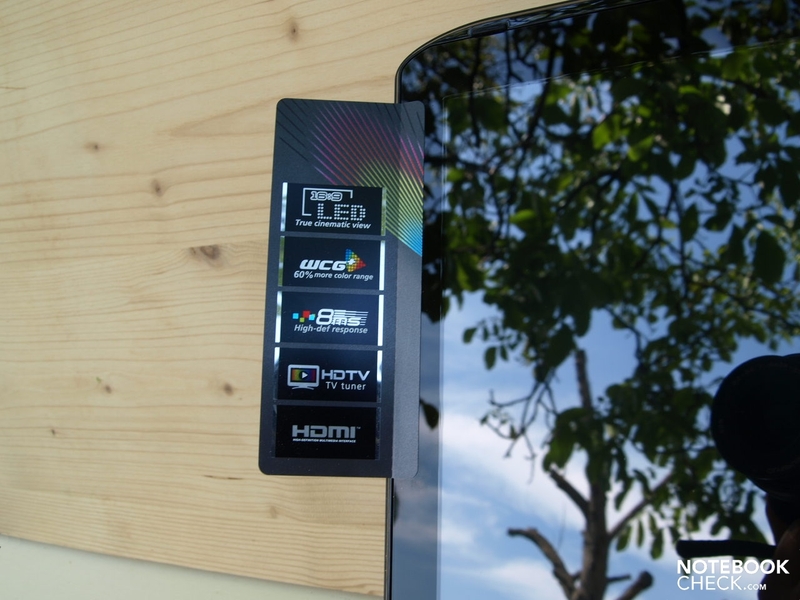 Conclusively, the right side also has an HDMI connection with HDCP support for a full-digital image and sound transmission, a VGA connection, an RJ-45 LAN port, the power socket and finally the connection for a Kensington lock. Models with a TV tuner additionally host a RF-in port. Our test device was equipped with neither feature, though. Aside from a Broadcom NetXtreme gigabit adapter integrated ex-factory, which provides for fast wired transmission at according infrastructure, there is also a WiFi 5100 AGN module built-in for a quick wireless communication with draft-n support. The test device also supports Bluetooth 2.0+EDR for a wireless networking of devices over a short distance. This is optional and not built-in to all models, though. An integrated fax/data modem or even UMTS is searched for in vain. UMTS can be, other than over an external USB modem, also be refitted via an ExpressCard, if fast wireless broadband communication is required. There is also an Acer Crystal Eye High Definition WebCam with a resolution of 1280x800 pixels at 30fps built into the upper display frame. Hence, there is nothing in the way of video conferences via Skype or optionally, not preinstalled in the test device, Acer Xpress VoIP Phone software. In regards to the operating system, Vista Home Premium 32 bit is preinstalled. Additionally, a whole range of Vista versions and also XP is supported. According drivers are available for download on the manufacturer's site. At a configuration of more than 4 gigabytes RAM, the choice of a 64 bit capable operating system should definitely be considered so that the whole memory can be used under Windows. The installed system had four gigabyte of system memory built-in. Merely a total of 3002 Megabyte, hence not even 3 gigabyte, was available for applications. A part of the installed RAM is reserved for the operating system and for installed devices (Memory Mapped IO). A further part, up to 384 megabytes, are branched off for the integrated GMA 4500 MHD graphic chip as the so-called shared memory. 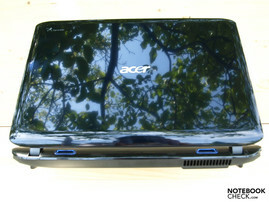 Acer gives a warranty of 24 months including a 1 year International Travelers warranty on the Aspire 5935G ex-factory. Fortunately, the keyboard shows a standard layout. 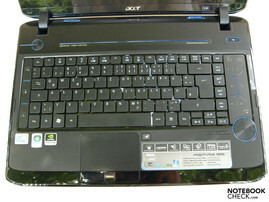 The separate numerical block of the Aspire 5536G has been omitted. That the keyboard is placed more to the left anyway, is due to the needed space for the multimedia control elements beside the keyboard on the right. The alphanumerical keys have been slightly reduced to a width of 17 millimeters and a depth of 17 millimeters as in the Aspire 5536G. But this time in favor of the space needed for the multimedia console. The arrow keys have turned out rather narrow and the F-keys had to forfeit a bit of height. The built-in keyboard unit was very pleasant at typing. Due to the standard layout all keys were hit immediately. Unfortunately, the keys substructure resiliently deflected noticeably. The type feel is alright, anyway. The stroke length demonstrates a subjectively pleasant length and the feedback is palpable but not abrupt. Generally, the keyboard can be pleasantly worked with so that even longer texts, for instance this review, can be inserted smoothly and untiringly. When typing more energetic, the key stroke may become more audible, but only really annoying was the jarring spacebar in the test device. 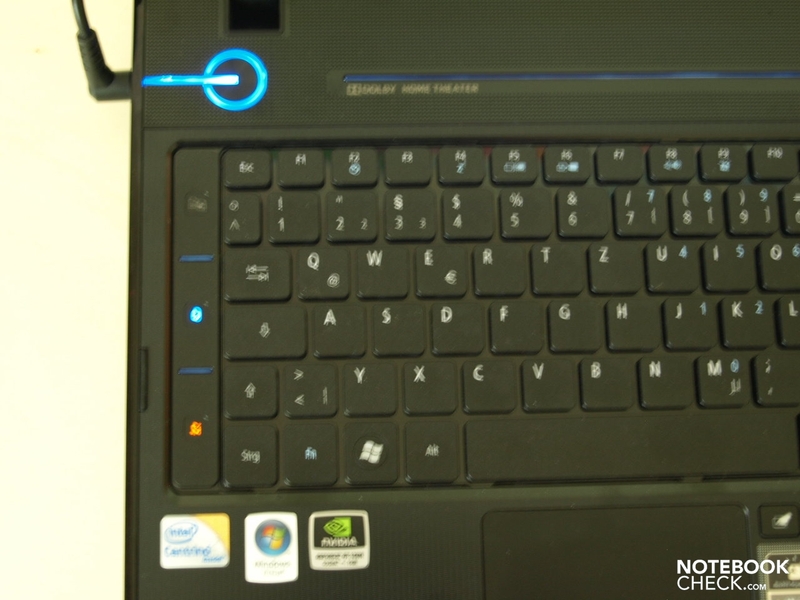 Besides that, the keyboard also has a direct illumination via white LEDs integrated in the keys. This can be easily turned on and off with the key combination Fn+F9. The touchpad received a pleasant size, with a dimension of 850 millimeters width and 540 millimeters depth. It confines itself haptically and visibly from the surrounding case through a component joint and is slightly deeper than this. The edges are very palpable, but don't stick out unpleasantly. 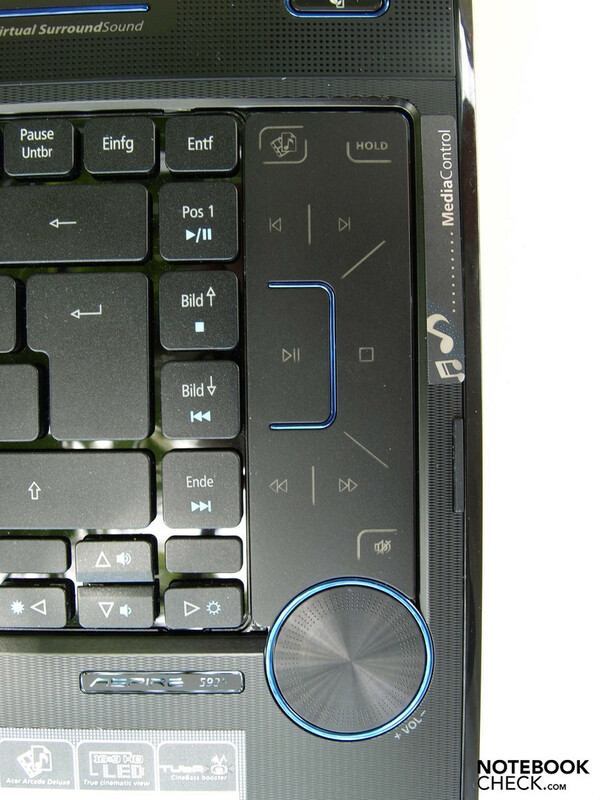 The built in touchpad from Synaptics supports a few multi-touch features for zooming and scrolling also. Even if there is a bit of getting used to in the beginning, they work perfectly at the end. There is also a vertically visual and haptical marked scroll area, whereby this marking could have used a bit more contrast to the rest of the touchpad in order to be even more visible. The pad's gliding traits are thoroughly okay; its surface feels pleasant, almost velvety. Principally, it is therefore also possible to move the mouse cursor easily and precisely. The correlating keys couldn't convince quite as much. Their haptic isn't as optimal due to the high-gloss finish. Their response characteristic is also a bit strange. While they are easy-going on the edges, they can only be pressed with a high effort towards the center. The cracking noise, which the keys emit, doesn't make a very elegant impression, either. Thanks to an own, directly beside the touchpad found button, this can also be quickly deactivated when necessary. 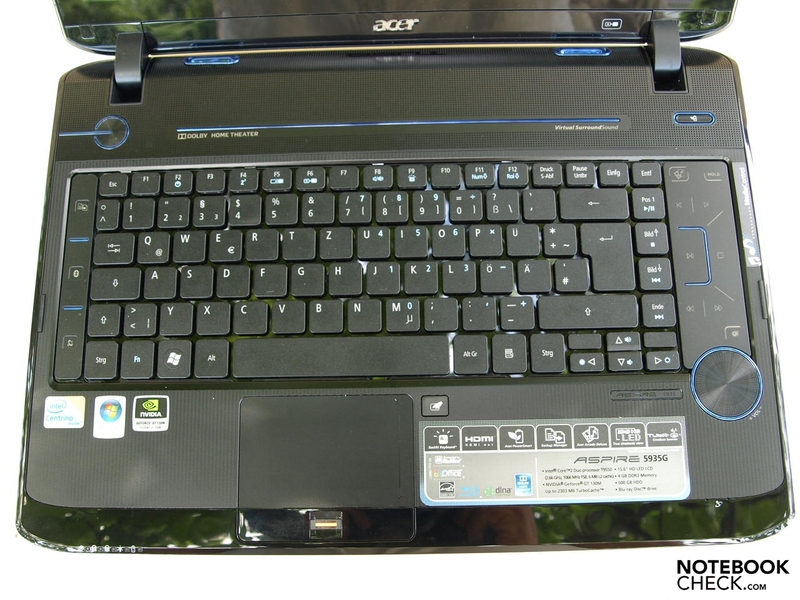 Left, beside the keyboard, the Acer Aspire has hot keys for control of wireless LAN, Bluetooth and for the start of Acer's Backup Manager. On the right, a multimedia console offers a quick start button for the preinstalled Acer Arcade Deluxe Software for watching films. Beside the usual control elements, you find a HOLD key (disables the control elements) and a mute key. The volume control has been implemented through a large, round, level dial embedded in the case. Whilst the volume control is easy and comfortable to use, the multimedia keys' response characteristic is to be criticized. These often have to be repeatedly till they finally react. The Power Smart Key above the keyboard on the right deserves a special mentioning. The user can switch between the energy savings integrated graphic solution and a performance-orientated nVIDIA GeForce GT130 M graphic card, depending on the energy or rather performance requirement. The energy savings mode is visualized by an integrated green LED key. 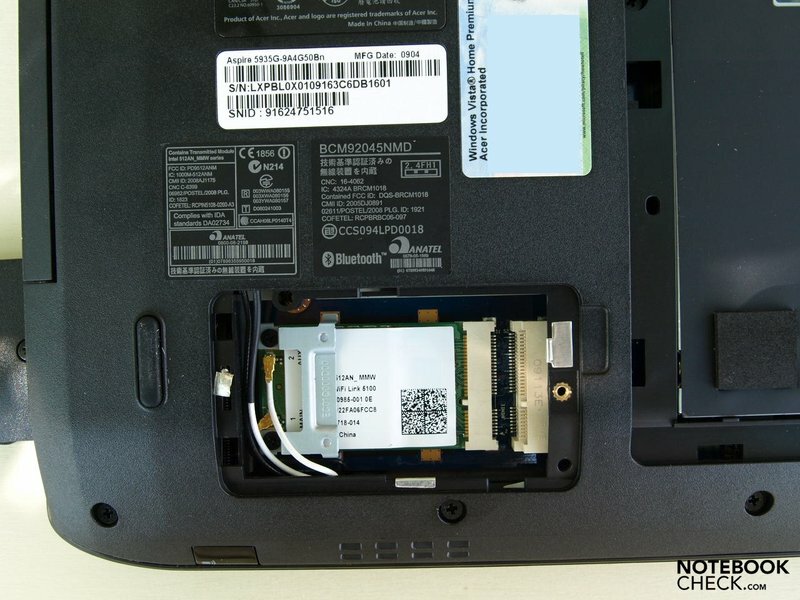 A fingerprint reader was integrated in the test device between the left and right touchpad key as an additional input device. When you stroke your finger slowly over the fingerprint reader, the Acer Bio Protection Software is started automatically. This has to be configured with the integrated system wizard at the first time. Afterwards the user validation can be implemented via fingerprints instead of passwords. 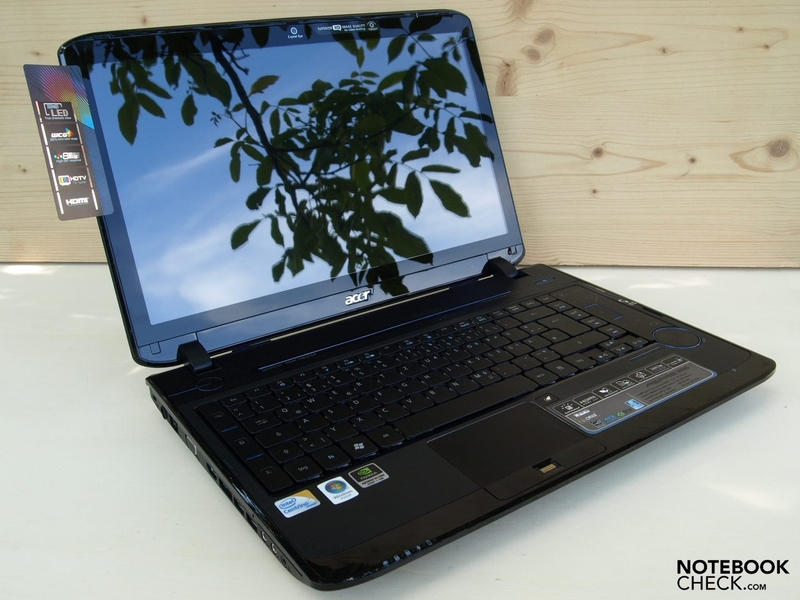 Just like the Aspire 5536 and numerous other notebooks, the Aspire 5935G follows the trend to use a 16:9 screen format. 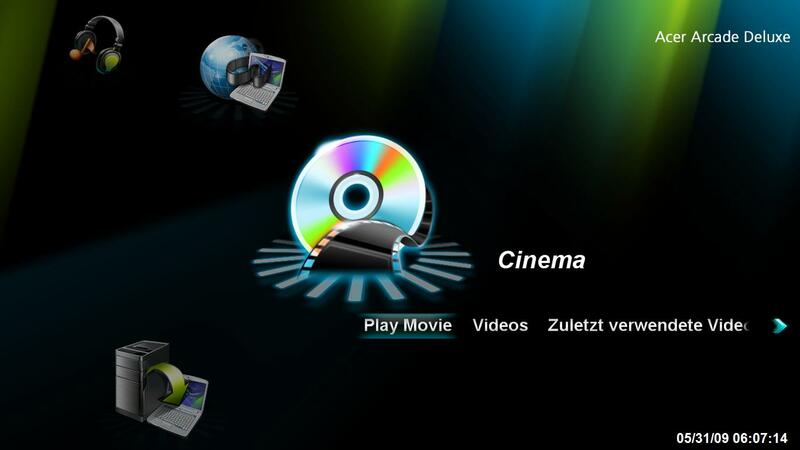 The computer display is adapted completely to the current cinematic format and makes a bar-free rendering of these movies possible, in the multimedia enterprises notion. But you shouldn't forget that we are still talking about a mobile PC, which has been conceived for a much broader application field than merely playing movies, which probably even only represents a small part of the application range. 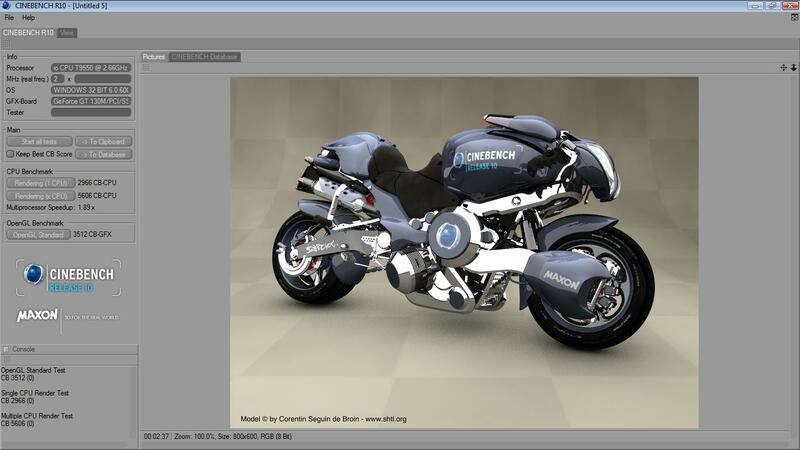 An according image height is of advantage in many other common and multimedia applications, though. And with this, we are then by the given resolution. With 1366x768 pixels there is slightly more image width in comparison to the 1280x800 format, but the image height has been slightly decreased for this. 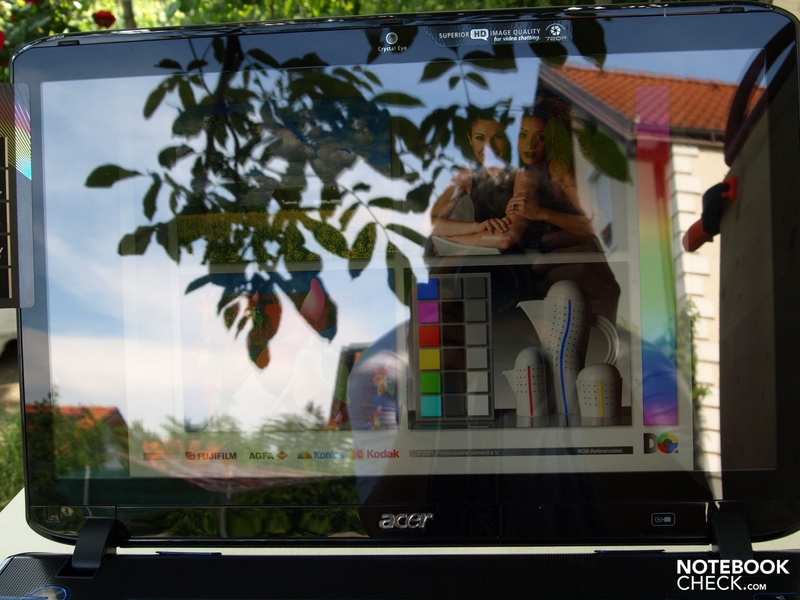 The Acer CineCrystal screen with LED Backlight is a display manufactured by LG with the model label LP156WH2-TLE2. This convinced in the test with a good, measured in the center screen area, maximum brightness of 263 cd/m2. The illumination doesn't turn out formidable with merely 76% because the brightness partly falls towards the edges and is only 201 cd/m2 in the bottom left sector. Due to a fairly high black value, the brightness of black measured in the center sector at maximum display brightness, of 1.57 cd/m2, the screen can't really convince with a contrast of 168:1. The black seems a bit too bright even subjectively and a white screen not homogeneously bright. Otherwise, the color rendering doesn't show any irregularities, subjectively. Intensely reflective display at adverse light conditions as, for example, outdoors. The reflective surface as a permanent work place does prove to be tiring on the eyes even though the light conditions of the work site were adequate. As much as you'd like to continue typing on the keyboard, the glossy display's characteristics force you to change to another computer with a matt surface. It's still quite alright at predominant indoor notebook use, except as a permanent work place, though. Due to the relatively intense brightness, outdoor use is possible with restrictions, even though strongly distracting reflections have to be counted with, as usual at adverse light conditions. As in many other notebooks display, the viewing angle stability turns out rather restricted in the vertical vision field. The slightest deviations from the ideal perpendicular viewing angle already result in a major image distortion. In the horizontal area, the display shows itself far more generous and also allows slanted viewing angles. But here there is an increase of unwanted reflections turning up, though. Based on the Centrino 2 platform, the Acer Aspire 5935G can be equipped with a whole row of Intel Core 2 processors. In the test device an Intel GM45 chip set, codename Cantiga, collaborates with a in 45 nanometers manufactured Penryn processor, an Intel Core 2 Duo T9550. 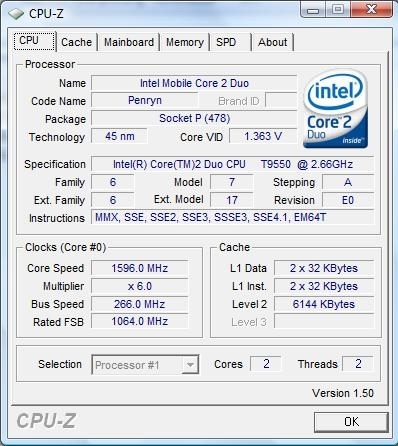 Specifications for this CPU are a 2.66 GHz clock rate per core, a 1066 MHz front side bus and a 6144 MB level 2 cache. This processor works, with a power dissipation of 35 watts, less energy saving, as its Pxxx counterpart, which is satisfied with 25 Watts. 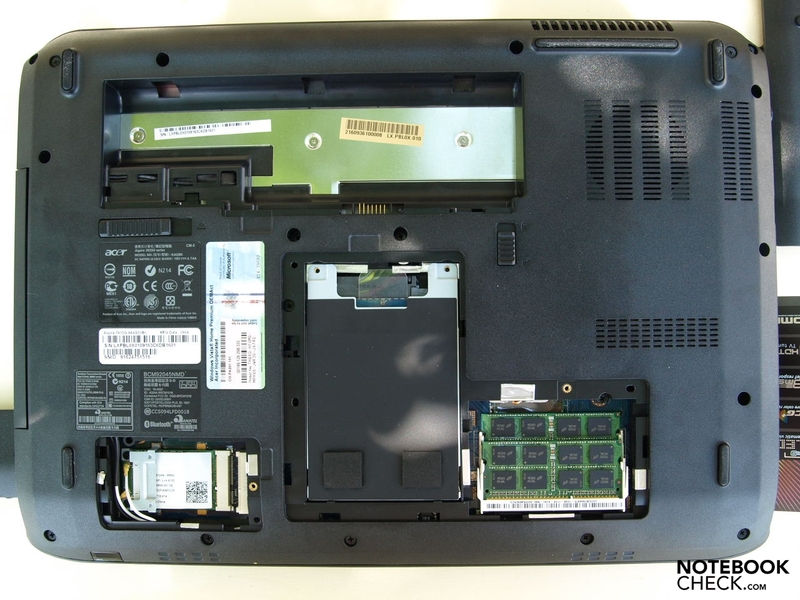 The Acer Aspire 5935G at hand uses in regards to graphical computing, the option given from the Centrino 2 platform to select between an integrated graphic chip and a dedicated nVIDIA GeForce GT 130 M graphic card, depending on the actual requirements of performance or battery life. 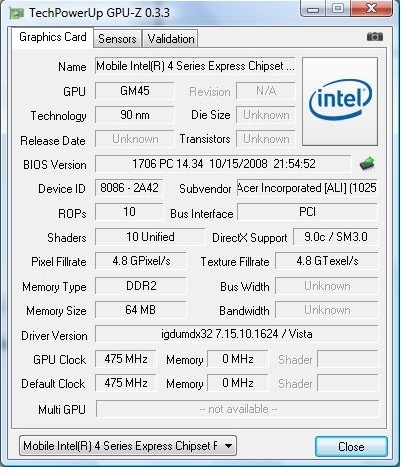 The integrated graphic chip set is a GMA 4500 MHD from Intel. 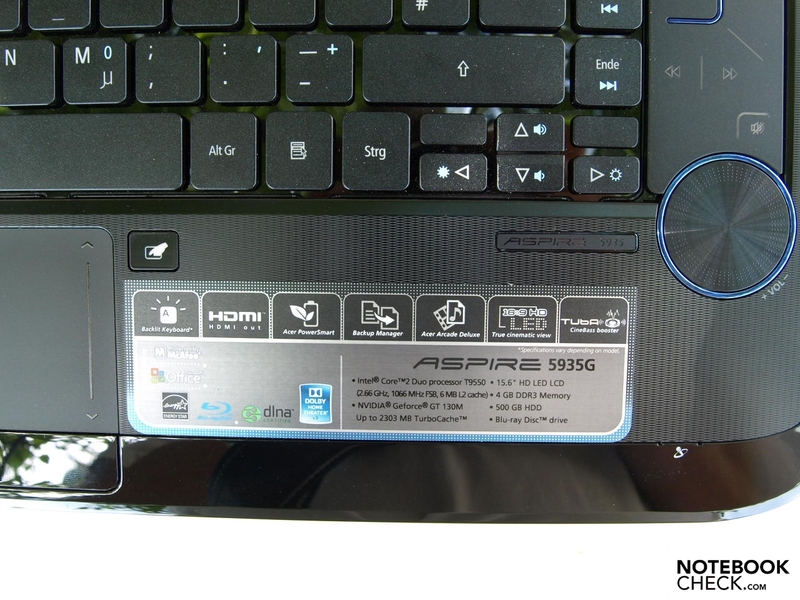 Over the Acer Power Smart key (right over the keyboard) it's possible to switch between the various graphic cards easy and fast witout having to reboot Windows Vista. Hence, the dedicated graphic card can be deactivated to save energy, if it's not needed in office mode or at internet surfing but a longer battery life is required. 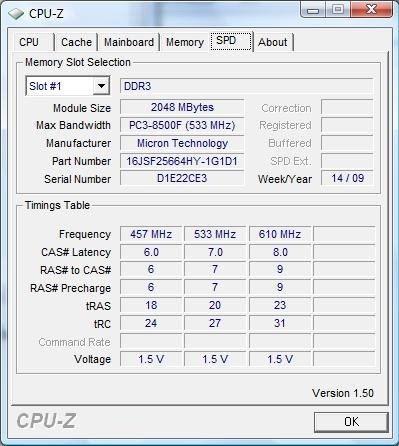 The built in nVIDIA GeForce GT 130 M was equipped with a DDR2 memory. Therefore it is, compared to systems with a GT130M with a GDDR3 graphic memory and otherwise comparable components, somewhat at a disadvantage in view of performance. 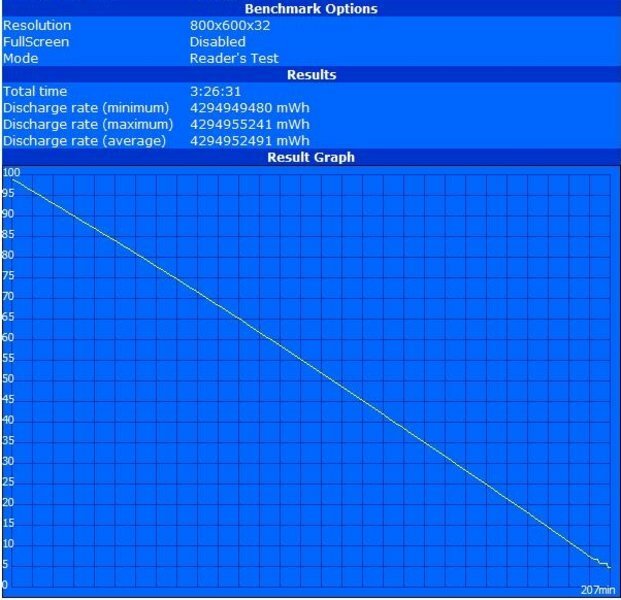 The Aspire 5935G with a Geforce GT130 M graphic card surpasses the simultaneously tested low-price starter notebook from the same manufacturer, an Aspire 5536G, by a whole of 43 % with its reached 6619 PCMarks in the PCMark05 benchmark and proves with this and also in the following benchmarks that the surcharge is justified. With this, it is at the same level as the recently tested mySN MG6 in regards to application performance. 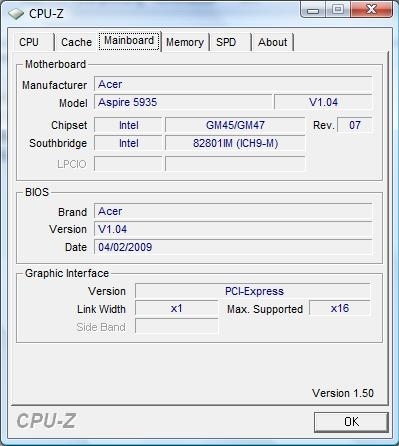 After switching to the integrated graphic chip set, an Intel GMA 4500 MHD, the performance sinks by 27% to 5207 PCMarks, but still surpasses the Aspire 5536G by 22%, anyhow. In the executed 3DMark2006, the system with nVIDIA GT130M graphic achieved 5566 points. 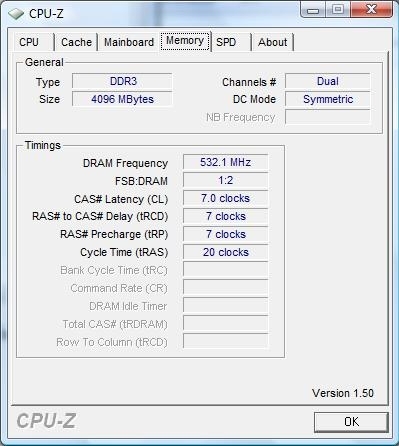 The use of the GDDR3 memory instead of the "normal" DDR2 RAM as graphic memory would probably increase the performance a bit. Then again in comparison with the mySN MG6 (6674 points), it cut off poorer by 18%. 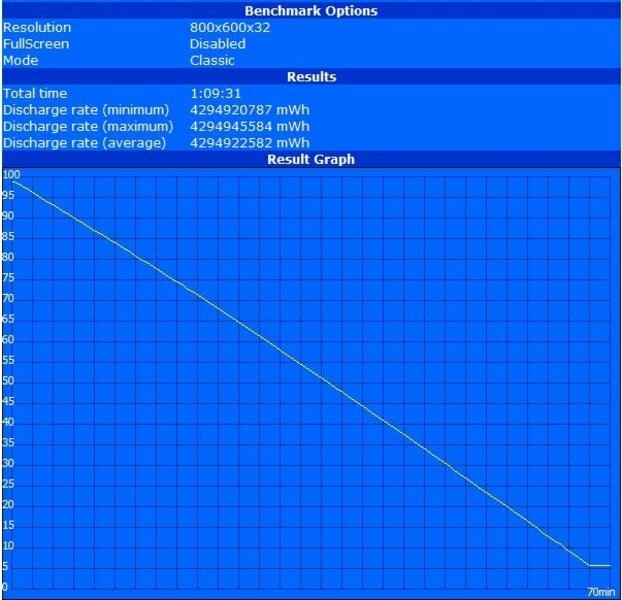 Here as well as in the Cinebench R10 Shading test (-41% for our test candidate - 3512 points; mySN MG6: 5975 points) it becomes obvious that our test device is orientated on not all too demanding applications, in the contrary to the mySN MG6, which wants to establish itself as a starter gaming notebook. 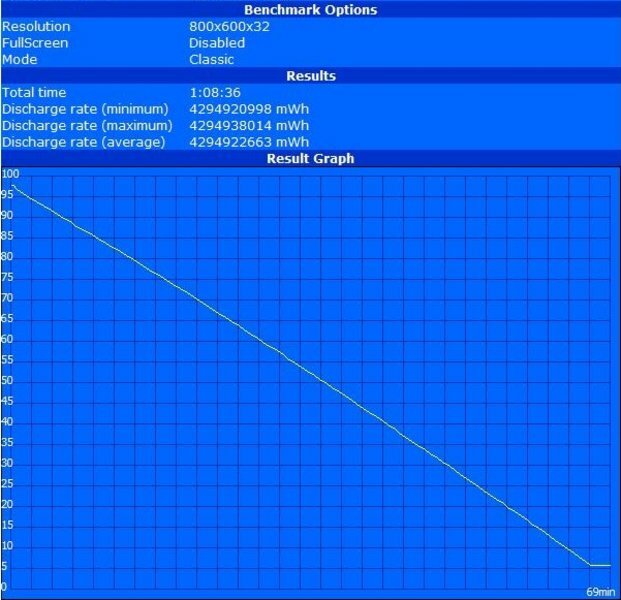 If you want to save energy by deactivating the nVIDIA GT 130M, the integrated GMA 4500 MHD jumps in, this having a lesser graphic performance by nature. 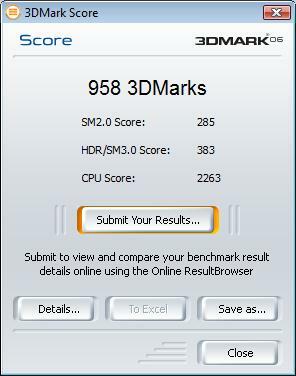 The system also comes up with a mere 958 points in the 3DMark06 benchmark test at the end. For only a bit of saved energy you pay with 481% of graphic performance in this case. If this is profitable in view of the minor increase of battery runtime under load and the short-lived battery life is questionable. Completely different performance increases are given by the use of the dedicated nVIDIA GT 130M, depending on requirement and application. 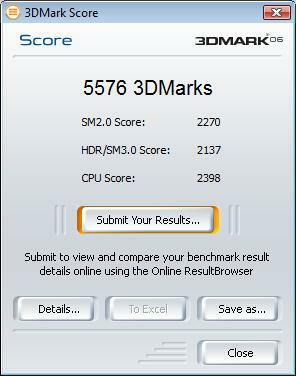 In the benchmarks 3DMark01, 3DMark03 and 3DMark05, for instance, you practically don't notice any improvements. For a further comparison the Cinebench R10 has been used. 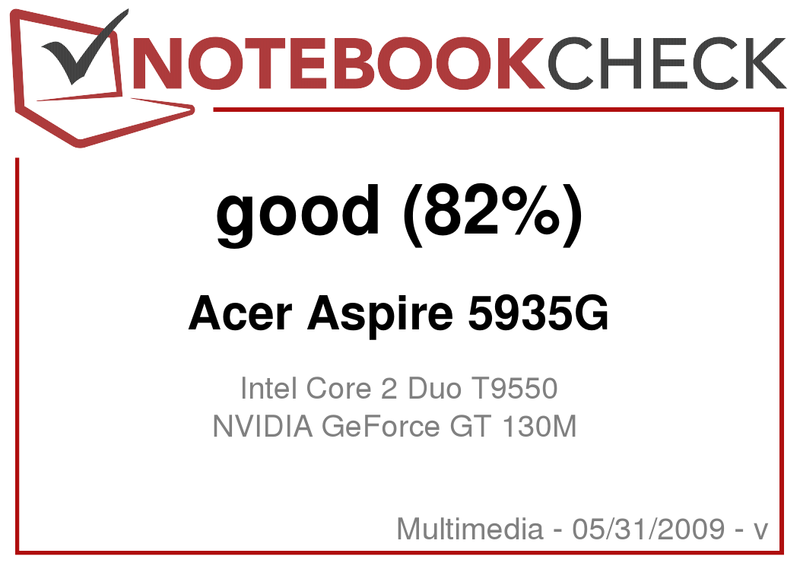 The system with an activated nVIDIA GT 130M can also be certified as having a rather large edge of 65% on the Aspire 5935G with an internal GMA 4500M chip, having achieved 3512 CB-GFX in the OpenGL benchmark. 1223 CB-GFX had been established for the latter. As expected, there weren't any significant deviations shown in the CPU benchmarks. Of course, the main memory configuration and the mass storage configuration have a part in the performance of the total system. 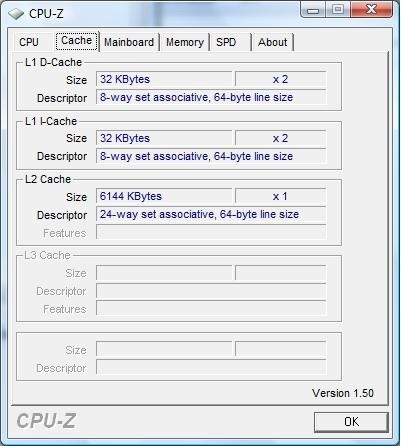 With a total main memory capacity of four gigabyte RAM, the system has synchronously also the maximum of a 32 bit operating system addressable RAM capacity. There are only 3002 megabytes that equals 2.93 gigabytes available for applications under Window Vista Home Premium 32 bit, though. Because of the integrated graphic adapter, which shares up to 384 megabytes with the RAM, the available system memory even falls under the 3 gigabyte mark. The rest is reserved for the operating system and for Memory Mapped IO. If you are considering upgrading the device up to 8 gigabyte RAM, a 64 bit operating system is definitely necessary. 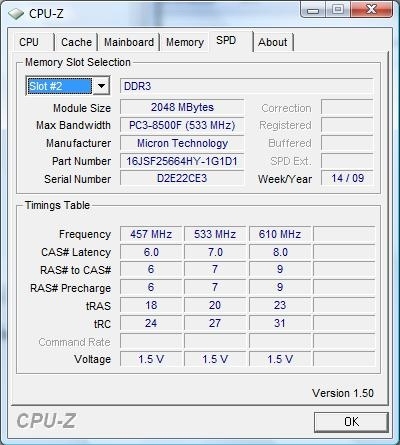 The maximum supported capacity from the mainboard is also reached then. Fortunately, upgrading this device is a piece of cake due to an easily accessible maintenance opening, but at least one of the built-in two gigabyte modules will be obsolete. A Seagate ST9500325AS, a serial ATA II hard disk is employed for the mass memory. There is vast space for user data with 500 gigabytes gross capacity. The data carrier in a 2.5 inch format reaches in the HDTune benchmark test a sufficient access time of 19.4 milliseconds and good transfer rates of up to 81.1 MB/s. 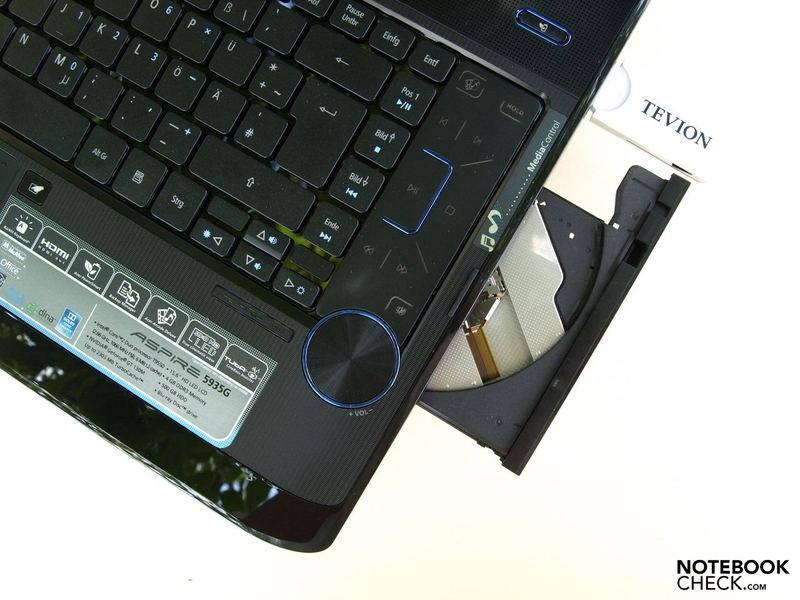 The built-in optical drive can read BluRay disks and write DVDs. In detail it is a Slimtype BD E DS4E1S ATA. 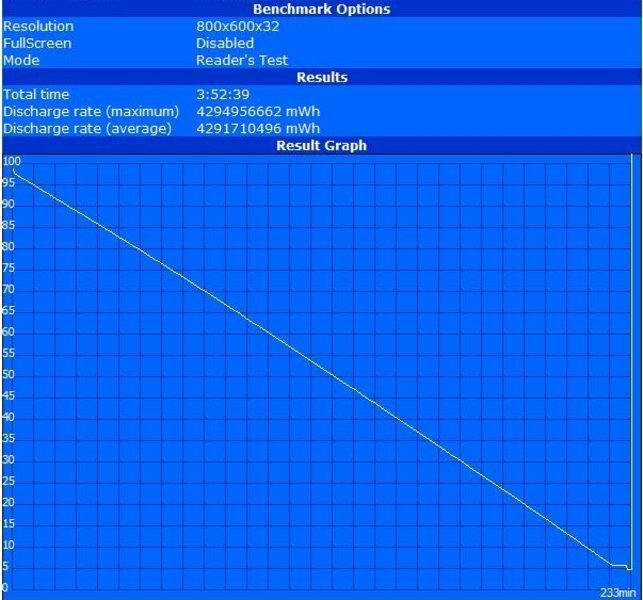 Due to the fairly good 3D graphic performance observed in the benchmarks, we wanted to take a closer look at the gaming performance of this notebook. 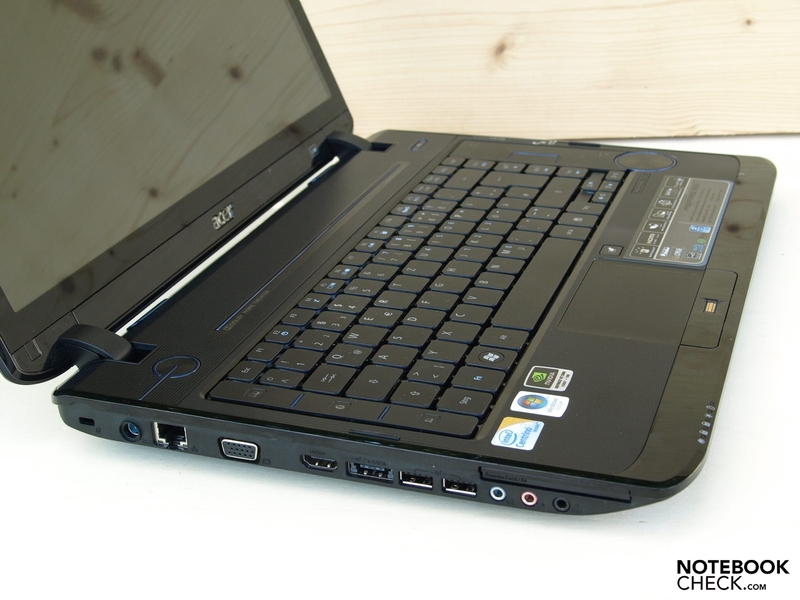 As expected, older titles like Doom 3 aren't a problem for the Acer Aspire 5935G. The game also runs smoothly with a high resolution and ultra details with 112.6 fps, as awaited. We looked at the popular shooter Call of Duty 4 on the Aspire 5935G in a further practical gaming test. If you choose the minimum resolution of 800x600 pixels and low details, the system achieves a very good performance with an average of 132.6 frames per second. A still playable performance is reached with a resolution of 1024x768 pixels and medium details at an average of 48.9 frames per second. It first gets tight for constantly smooth gaming fun with merely 25.02 fps at a resolution of 1024x768 pixels, high detail settings and a quadruple anti-aliasing in view of performance. The next one in line was Crysis. The Acer Aspire 5935G with an nVIDIA GeForce 130M GT graphic reached 79.62 fps in the GPU benchmark test (three run throughs, best value) at a resolution of 1024x768 pixels and low details. At the same resolution but medium details the frame rate already decreased to 34.03 fps. Finally at high details, there is merely an average of 19.06 possible. Further tests show that you can play modern and 3D-biased games fairly pleasantly with the GeForce GT 130M at a resolution of 1024x768 and medium settings. That is with exception of GTA IV (Grand Theft Auto), which sets an especially high demand on the graphic performance and for which you should stay at a resolution of 800x600 pixels and low details. With these settings an average of 38.11 fps is still possible. An increase of demand to 1024x768 and medium details results in a frame rate decrease down to 26.06. At high resolutions you also come to the performance limits of the following games, where a smooth, studder-free gaming is no longer possible. Resolution 1280x1024, alla medium/on, 4xAA, bilin. 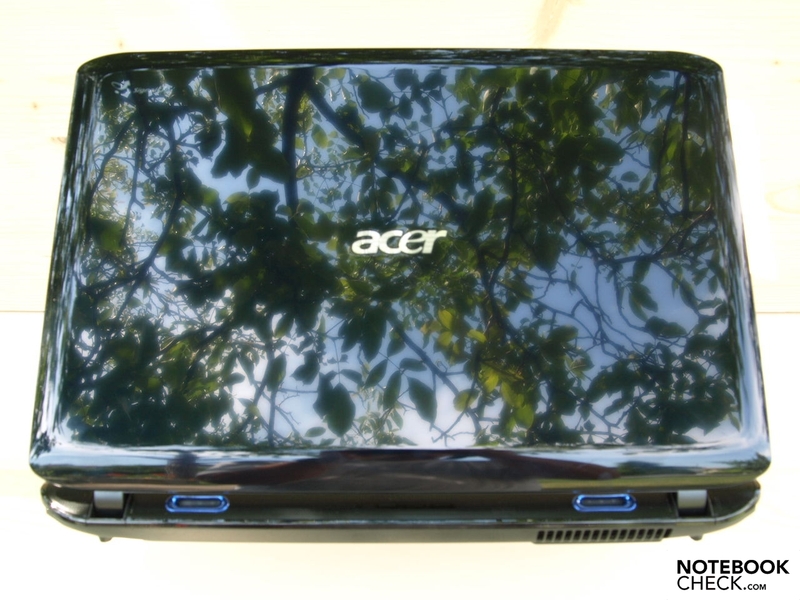 For a multimedia notebook with relatively efficient hardware, the Acer Aspire 5935G is in idle mode, or rather low load, hence office mode or internet surfing, a pleasantly quiet device. 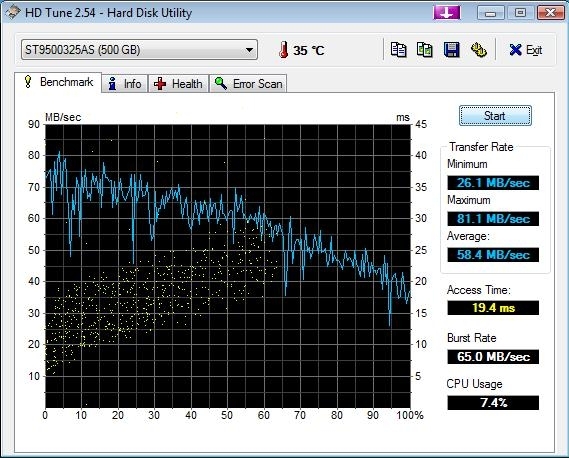 With a deactivated nVIDIA GT 130M graphic card it reached a maximum volume of 30.9 dB(A). The hard disk is marginally louder at access with 31.2 dB(A). 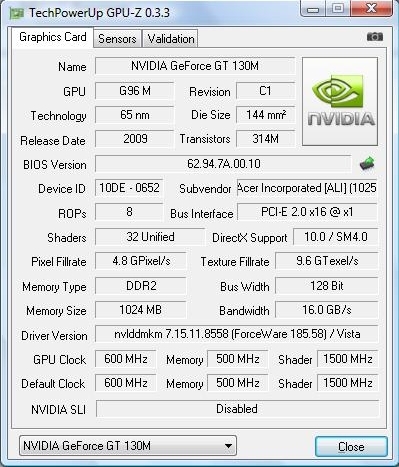 It can be called loud under load with activated nVIDIA GT130 GT graphic with 40.9 dB(A), though. Depending on the application this is more or less important. For instance, because during a game the attention is attracted to the game you will notice the system noises less. The DVD drive is fairly loud with 49.6 dB(A) during data transfer. Fortunately, the operating noise is kept within a limit while watching movies with 32.7 dB(A). The heat distribution is very similar to the 5536G. Especially the left to center upper side gets noticeably warmer than the right on the Aspire 5935G. A maximum of 39.5 degrees could be measured in the left back sector, above the louver. This heating-up is partly very contoured when controlling games with the keys A-W-S-D.
On the bottom side a maximum of 46.7 degrees Celsius could be established in the left back sector. It becomes very warm in the area of the vent, subjectively. (±) The palmrests and touchpad can get very hot to the touch with a maximum of 36.3 °C / 97.3 F.
(-) The average temperature of the palmrest area of similar devices was 29.1 °C / 84.4 F (-7.2 °C / -12.9 F). 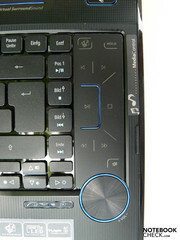 Both loudspeakers, built-in left and right above the keyboard, discharge the audio-out in stereo. They are supported by a Tuba CineBass Subwoofer (blue) on the notebook's back edge. The sound system being Dolby-optimized is well paid off. The sound is full and the trebles balanced with good basses. The signal over the 3.5 mm headphone socket doesn't show any irregularities, either. According to Acer, it also supports S/PDIF for digital loudspeakers. The included battery is a 3 cell battery with 48 watt hours with the label BF9E made by Sanyo. All measurements were executed with an activated and deactivated nVIDIA GeForce GT 130M. 207 minutes, that is 3 hours and 27 minutes could be noted with an activated nVIDIA GeForce GT 130M graphic in the BatteryEater Reader's test, representative of the maximum runtime to be expected at minimum display brightness, deactivated WLAN in the Window's energy savings profile. With the internal graphic card the battery life could be extended to 233, hence 2 hours 53 minutes, in percentages this is 13%. A dramatical runtime crash is noticed under load. In the BatteryEater Classic test (load, max. display brightness, WLAN on, profile high-performance) the runtime sinks to merely 69 minutes, hence short over an hour, with the nVIDIA Geforce GT 130M. In opposition, with the Intel GMA 4500 MHD the battery discharges in 70 minutes, hence there is practically no difference. A runtime of about 130 minutes, that's a bit more than 2 hours, can be counted with in the practical surf mode at maximum display brightness and active energy savings profile, the nVIDIA Geforce 130M graphic With 170 minutes, correlating to 2 hours and 50 minutes, an improvement of 31% was possible. 141 minutes were established with the nVIDIA 130M graphic card at DVD rendering. At maximum brightness and high-performance profile, though. Therefore the runtime is sufficient for a one and a half hour movie, also with an independent graphic card. 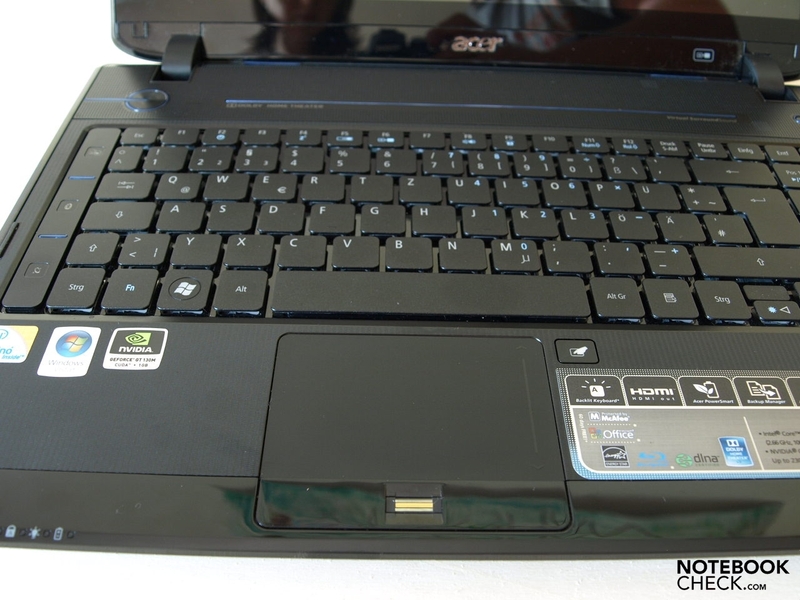 Generally, the Acer Aspire 5935G-9A4G50Bn presents itself as a solid multimedia notebook, which doesn't make a secret of its application field. It already signals itself as being a genuine device conceived for home use with focus on multimedia, with a separate multimedia console and a reflective display in a 16:9 cinematic format. The built-in components also support this course. With a BluRay reader and a Dolby-optimized sound system with subwoofer, nothing is left to be desired at movie rendering. 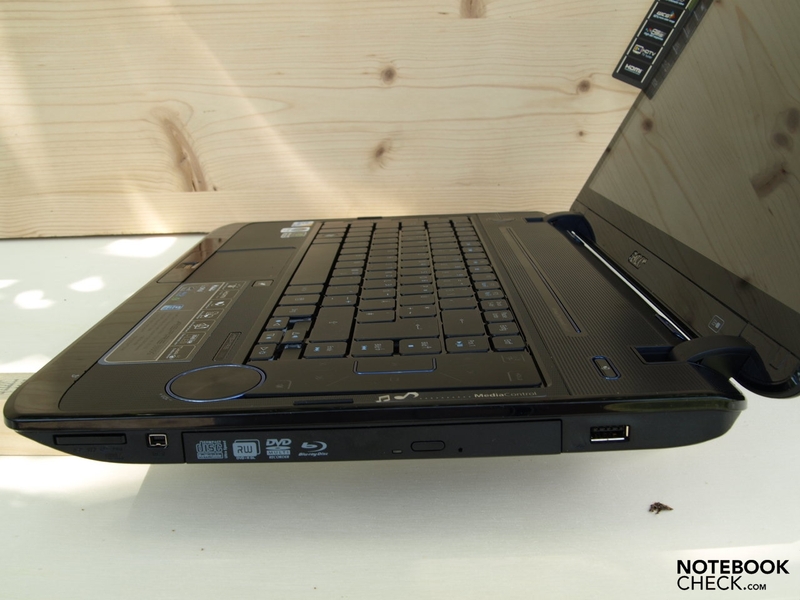 The tested Aspire 5935G can also offer quite a good graphic performance, which also allows the one or other demanding game in middle settings when the built-in nVIDIA GT 130 M graphic card is activated. 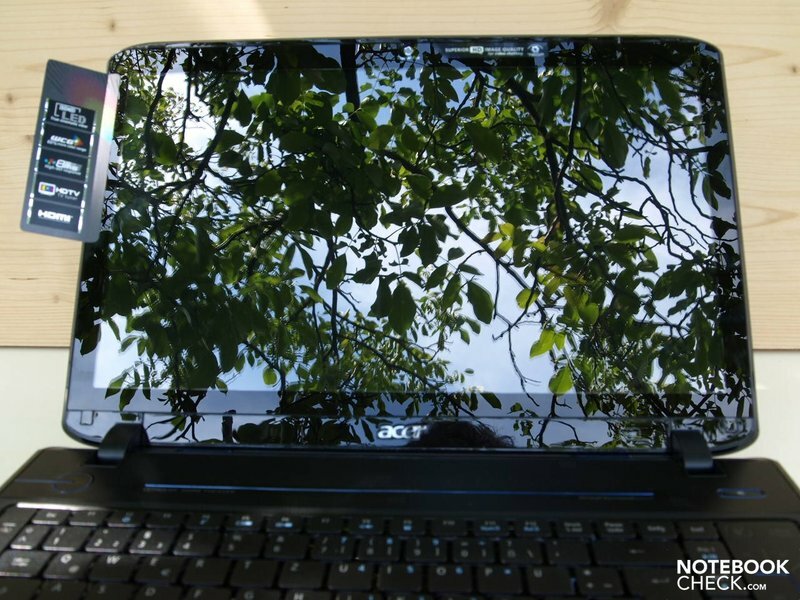 The mobility of this notebook is definitely restricted through its fairly short battery life and reflective display. Outdoor use is also definitely not to be recommended. 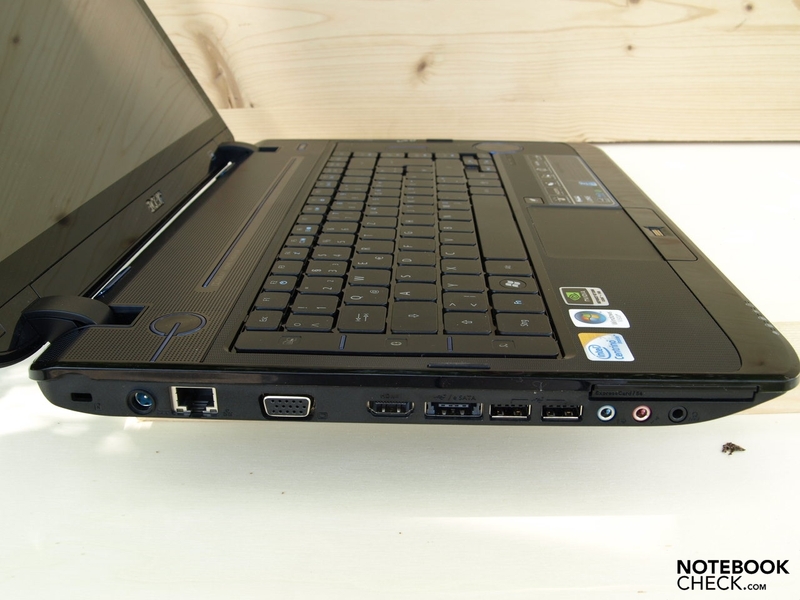 The 5935G is therefore generally a good notebook for home movies, multimedia applications and occasional gaming. At interior use, good surrounding light conditions should be regarded. It hasn't been designed, nor is it suitable as a permanent work device for pros, already due to the reflective display. 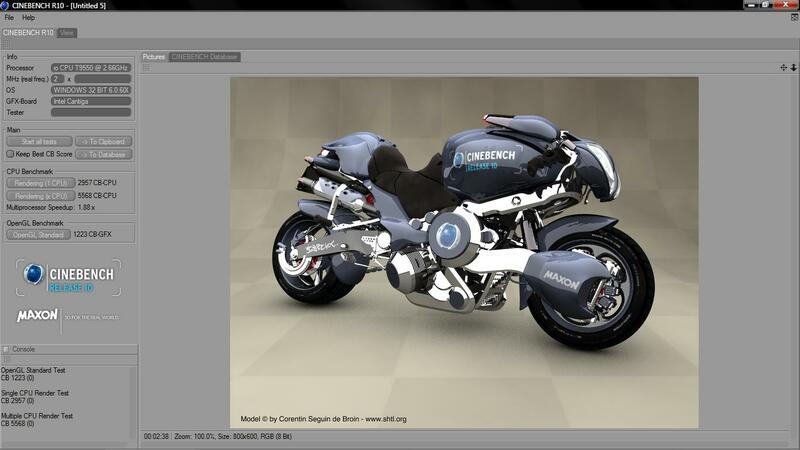 Functional design in a 16:9 cinematic format. In opposition, the keyboard invites to a longer stay at this device. The touchpad can convince with pleasant gliding traits. The structure applied for the wrists rests also feel good. 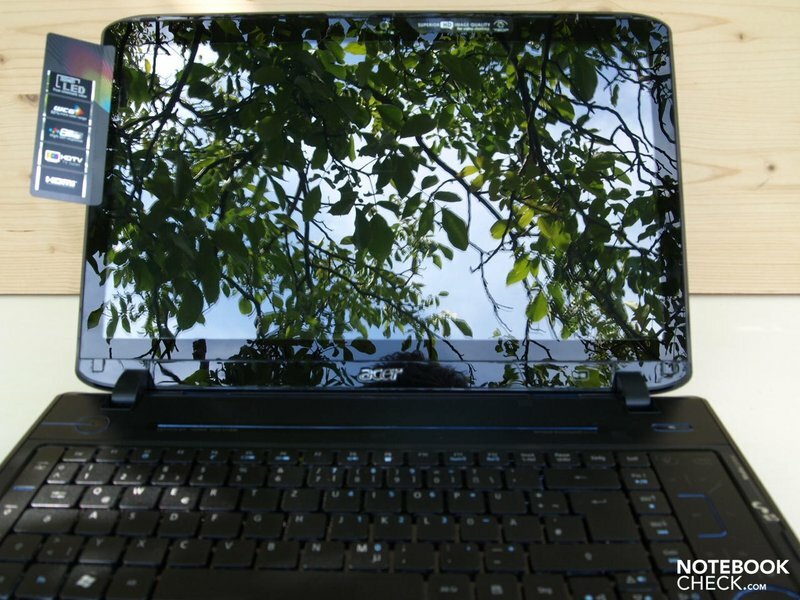 But the high-gloss finished touchpad buttons couldn't convince. 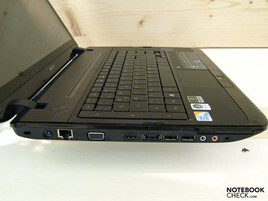 ...with an Intel Core 2 Duo T9550 CPU, selectable graphic solution with nVIDIA Geforce GT 130M and 4 gigabytes RAM. If maintenance should be necessary, this is possible without problems through the generous maintenance cover on the bottom side. At least one module has to be exchanged for a main memory upgrade, though. Besides, a 64 bit operating system is then required, if you want to benefit from it. 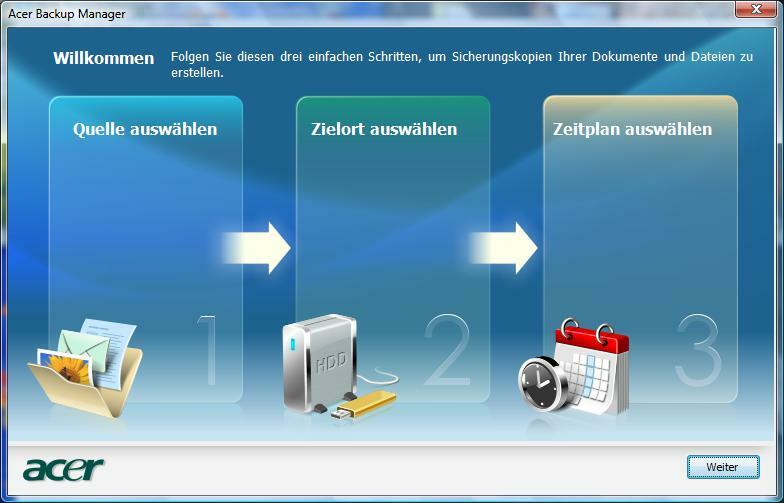 ...and the WLAN module accessed. The reflective display unnecessarily restricts the mobility and proves to be strenuous for the eyes at permanent use. …lefties won't be quite so amused. Apart from that, the USB 2.0 ports on the left are very close to each other. The Acer Aspire 5935G doesn't leave a doubt about its clarity of commitment to its designated application field of multimedia. …also wireless connections (WLAN, Bluetooth)..
...and the Acer Backup Manager can be accesses easily by the push of a button. ..."connected to power source"... ...and "on". Aside from the Acer Arcade Deluxe Software for movie rendering, quite a lot of other programs are preinstalled. Beside the stereo loudspeakers, a subwoofer also provides for a good, bass rich sound. The battery life of the included 3 cell 48 Wh battery leaves a bit to be desired. Switching to the integrated graphic chip set via Acer Power Smart doesn't change this much, either. The clarity of commitment to the designated application field of multimedia applications, which isn't only reflected in the design, but also in the choice of components. Too bad that the short battery life and reflective display don't really allow for an outdoor mobile mission.